Lead Poisoning - From My Player Piano? Lead Poisoning! ..... From A Player Piano??? Lead is a cumulative poison, meaning it builds up in your system. The more often you have contact with it, the more precautions you should take. If you handle it often, it's important that you obtain and use good protection. As always, when in doubt, exercise increased caution. My greatest concern is human well being! Lead has been a known toxin for decades. Its adverse effect on the brain and the central nervous system (as well as other body parts) is well documented. Government agencies have been created to help insure that Americans are not needlessly or carelessly exposed to the hazards of lead in any of its many forms. However, after studying the readily available information on the Internet for just a week, it became quite obvious that the present dangers created by the existence of lead tubing and lead-laden parts in player pianos has never been addressed specifically by anyone. Hopefully this web page adequately addresses that issue. Should I handle the old lead tubing? Is the tubing a threat to me and/or my family? Can I safely operate my player piano when my children are close by? Should I have the old tubing removed immediately, and replace it with rubber tubing? Is this whole treatise the result of an overly concerned player piano technician who got scared by facts? For those who are unfamiliar with that term: LD50 means that half of all animals (extrapolated to people) that take the stated amount into their bodies will die. That is, it is a "Lethal Dose" for "50%" of the population. If the LD50 is 100 mg/Kg, half of people weighing, say, 70 Kg (154 lb.) will die if they take in 100 mg/Kg X 70 Kg = 7,000 mg or 7 grams of the substance. That's about 1/4 of an ounce. For those of you who fish, you know how little a 1/4 ounce fishing weight is and what it looks like. For those of you who do not fish, or have no idea how small that weight is, it's about the size of a 1/4 inch diameter ball. The point is, it doesn't take very much lead to kill the average sized human being. And the smaller you are, the less it takes. How Should I Handle Lead Tubing? When handling lead tubing there are a few precautions which should always be observed, regardless of the condition of the tubing. Of these precautions, the most important one is the wearing of protective gloves. Almost any type of plastic or synthetic glove will work just fine. However, stay away from gloves that are made from a fabric (either synthetic or natural) unless you plan to throw them away when you're done. The point is to keep the tubing from coming in direct contact with your skin, especially if you have any open sores or wounds. Furthermore, it should go without saying that you should never touch your face while working with lead. Next is the wearing of some sort of a face mask. Here, the primary concern is to reduce the inhalation of lead-laden dust to a bare minimum. Obviously, the better the mask, the less dust you will inhale. In situations where the lead tubing is fairly intact, there will be very little dust created by removing the old tubing. Conversely, when the tubing is completely oxidized all the way through, lots of dust will be created no matter how careful you are during the removal process. And since really bad tubing usually breaks at the point where it is cemented into the wood, you'll have to use a drill bit, or some other kind of scraping (or cutting) tool to get the old tubing out. Naturally, these kinds of actions will increase the amount of dust that's 'thrown' into the surrounding air. So my recommendation is to try to do the job outside the confines of a shop (or home) and away from areas where kids might get into the dust. The correct way to dispose of lead tubing does vary from state to state, but it should never be put into a garbage bag and set out with the rest of the trash. If you don't have a recycling company near you that handles hazardous waste materials, you should contact your local trash company and ask them for instructions. However, most metal salvage companies do take lead, and they might even give you a small amount of money for your effort. Also, most city dumps have a special bin for batteries and other products that contain lead. Here, the thing to remember is that there is a concerted effort on the part of everyone, who knows about the hazards of lead, to keep it from getting into our drinking water and our food. So do the right thing and call the appropriate people if you're not 100% sure of the correct procedures. Is Lead Tubing a Real Threat? It should be fairly obvious by now (if you've read the preceding information) that lead, in any form, is dangerous to humans (and all other animals). If ingested (eaten) or inhaled (as in the case of lead-laden dust) in sufficient quantities (as explained above), you will die! Furthermore, both chronic and acute medical problems can occur with only mild/direct exposure to relatively concentrated doses of lead in any form when it is ingested. For the novice, and professional rebuilder alike, this means that when you're working on an old player piano you must exercise a high level of caution as you take it apart, clean it, and dispose of the remains. When taking it apart, especially in a home, it would be very wise to remove small children, who are most likely to 'touch things', to another room. (What small boy could keep from blowing at a small pile of dust, just to watch it 'fly'?). If the unit is being dismantled for the first time, wearing latex or rubber gloves would be a good idea. Besides, they would give you an added layer of protection against other things like; the sharp edge of a cracked supply hose, the slipped screwdriver or the bruised knuckle. 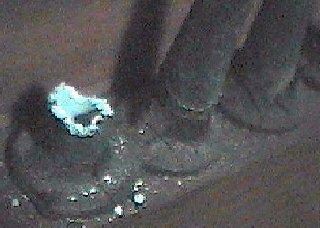 If, on the other hand, you crack the first old hose and a mass of grayish looking powder comes pouring out, you better have a fairly good mask on before you stick your head into the lower section and try to remove the 'stuck' pieces from those pot metal fittings (which are part lead). As stated above, the correct method of disposal varies. But for practical reasons, it's best to put all lead and lead-laden materials (like the paper towels that were used to clean up) in a container labeled "Hazardous", or "Hazardous Materials", or any other name that implies "deadly to humans and all other living things". And while I admit that might sound like 'overkill' to some people, it will reduce the risk of accidental exposure to children. The numbers don't lie. What might make an adult really sick could easily maim or even kill a small child. Here again, if you're unsure about safe disposal methods, ask the people who get rid of garbage. Should I Operate My Player Piano? If you started at the top and you've reached this point, you might be thinking that you'd have to be stupid to operate a player piano that still has lead tubing and/or lead-laden parts. If so, perhaps I owe you an apology. It was never my intention to scare anyone to the point that they would stop enjoying their player piano! A large percentage of all WORKING player pianos have been restored and/or repaired to some degree. Typically, most, if not all, of the bellows cloth has been changed at least once, and all of the rubber tubing has most likely been replaced. These actions alone render most player pianos very safe indeed. In such units, a relatively massive amount of cleaning was accomplished during the rebuilding and/or major repair processes. If your unit falls into that category, the odds are heavily in your favor. However, I have encountered numerous player pianos in which almost everything BUT the tracker bar tubing and lead-laden parts have been replaced with safe materials. And therein lies my second greatest concern. Units that are operating fairly well, or even quite well, that contain the original, 80+ year old tubing are, in a sense, time bombs with no readily visible fuse or timer. The only way to determine the actual condition of the inside of a lead tube is to cut it open and look inside. And once a tube is cut, and depending on where it is cut, putting back together can be a bit of a problem. However, a well experienced player piano technician knows where to look to see visible signs of an impending problem. Most commonly, that location is the point where the lead tubing is cemented into a piece of wood. 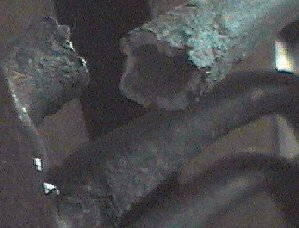 The two pictures below are examples of seriously deteriorated lead tubing. Note how the pieces of tubing (that are still connected) appear to be fatter near the point where they go into the wood. Should I Remove the Old Tubing? The cost for replacing lead tubing does vary from unit to unit. Generally speaking, the job should take less than six hours in total. To accommodate the differences between various makes and models, most technicians, including myself, charge by the hour and not by the job. This method of doing the work also allows the technician to spread the job out over a few days as opposed to trying to complete the job in one day. One reason for using this approach is to spread out the number of continuous hours of exposure to the lead and/or lead-laden dust. On the surface, one would think that a 'working' player piano is one that still plays the music roll. However, this is not really the case. A 'working' player piano is actually one that still operates with the foot pedals. Units that have been 'electrified' may only operate because the electric vacuum pump is overpowering the leakage cause by deteriorated bellows cloth and/or old valve leather. During the 50's and 60's it was fairly common to simply add an electric vacuum pump to get a few more years out of the old leather and cloth. In units that fall into that category, chances are very great that the unit has never been opened up and thoroughly cleaned out. And since such units have much more air passing through them than units that have been properly restored, the amount of contaminates that they exude is far greater. Click here for information about testing your player piano. Look, I am not a doctor, a chemist or a metallurgist. I am John A. Tuttle, a player piano technician/rebuilder. All of the information above is nothing more than an educated opinion on the matter of lead poisoning and player pianos. Therefore, everything contained herein may in fact be out of date and/or completely inaccurate and erroneous. When in doubt, contact your local EPA or OSHA agency to get the latest and most accurate information, or visit the EPA web site at: http://www2.epa.gov/lead. If you'd like, read the pamphlet: Lead Sampling - Technician Field Guide ('lead_handbk-2a.pdf'). For information about what businesses can do to train their employees concerning lead exposure, go to the 'OSHA Lead Standards Online Training Course' at Atlantic Training LLC. This web page was started on November 10, 2000 by John A. Tuttle (John A Tuttle). It was last updated on June 5, 2015.